Broadly speaking, bioenergy is the use of biological materials in electricity generation. The fuel for that process is called biomass, and can include timber residue, green waste from farms and gardens, or even human and animal waste. This graphic from Hu Honua shows how each harvested tree will be used. The Hu Honua Bioenergy project in Pepe’eko plans to burn eucalyptus trees to generate up to 30 megawatts of electricity per day. The U.S Departments of Energy, Agriculture, and the EPA recently declared biomass to be a renewable energy source and forest bioenergy to be a carbon-neutral process. But the reality is a little more complicated. Michael Cooney, a researcher with the Hawaii Natural Energy Institute, said that any resource can technically be considered renewable if it is consumed at the same rate at which is regenerates. In practical terms, this makes fossil fuels non-renewable for human purposes. 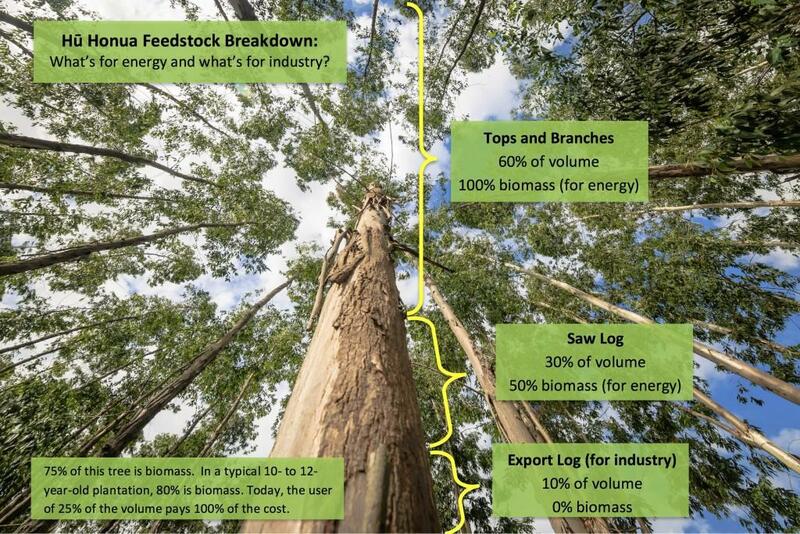 Bioenergy from forestry can be considered renewable only if the forest can be replenished at the same rate they are consumed. 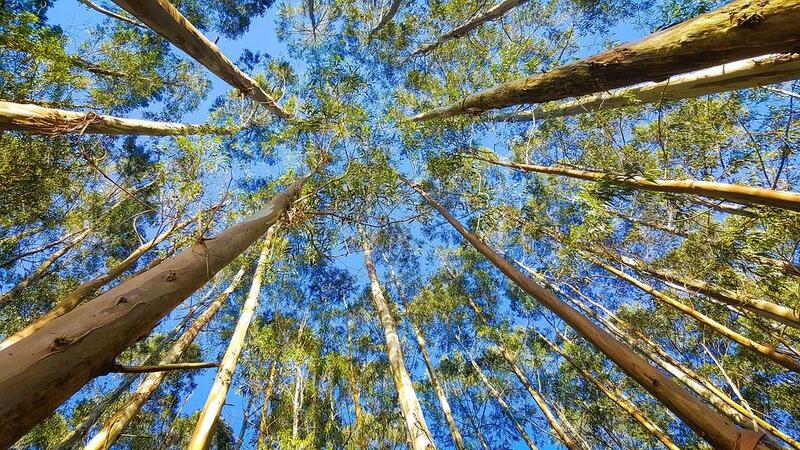 According to the comapny, Hu Honua will consume approxiamtely 700 tons of eucalyptus per day. The company currently has 10,000 acres of land under lease for forest cultivation and is open to acquring more. With East Hawaii’s plentiful rainfall and a relatively short 5-10 year growth cycle for eucalyptus, it is within the realm of possibility to make this a renewable process. That matters because State of Hawaii passed a law requiring power producers to be100% renewable by 2045. Designating Hu Honua as a renewable operation allows it to meet that requirement. But there is also the issue of carbon emissions. Although the federal government considers this a carbon neutral process, it is a hotly contested issue globally. Whether or not the process is in fact carbon neutral depends greatly upon the type of system used and the pre-burning treatment of the fuel. There are also other carbon emissions baked into the process from things like transporting fuel to the plant. Hu Hona has committed to making the process carbon neutral and plans to plant extra trees to offset those additional emmissions. Water is another major concern with the project. The Hu Honua plant will pump 21 million gallons of brackish ground water every day. That water will be used to cool the system and then pumped back underground through several nearby wells. 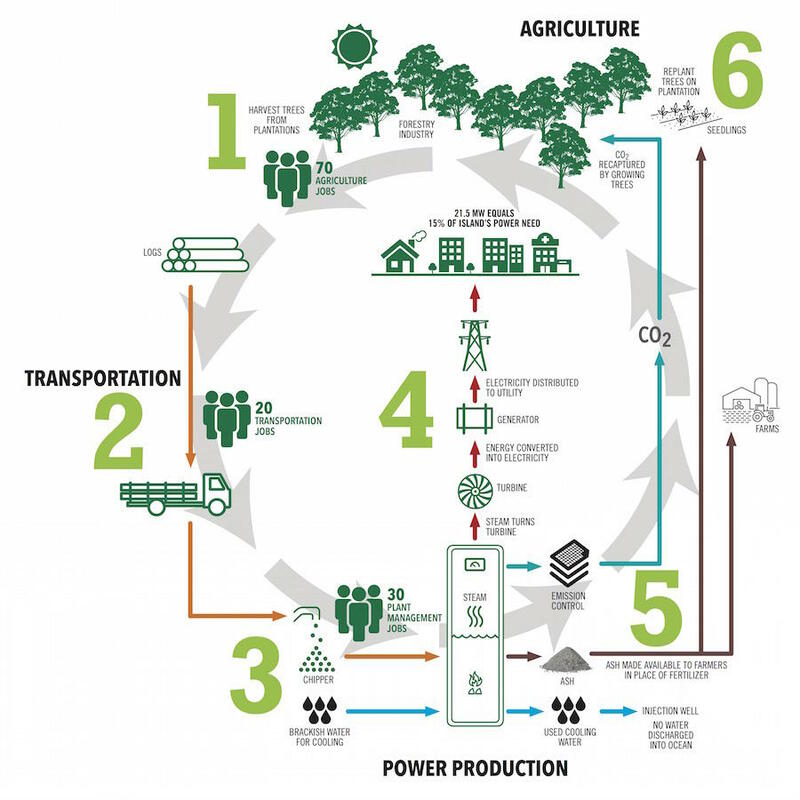 An infographic from Hu Honua showing how it will turn trees into energy and process waste products. Opponents of the project are most concerned with Step 5, which includes the re-injection of cooling water into an underground aquifer. According to Hu Honua, water going into the injection wells will not affect the nearby ocean or mix with drinking water. The community environmental advocacy group Malama Hamakua has raised concerns over the temperature of the water being reinjected, as well as possible chemical contamination. Hu Honua President Warren Lee maintains that the company is following all environmental laws and has worked closely with state and county regulators. He told HPR that water injected into the ground wells will be about 14 degrees Farenheit warmer than its natural temperature, but the company’s computer modeling estimates that this will produce a warming effect of less than half a degree Fahrenheit in the ocean around the plant. Lee also stated that any chemical discharge will be within safe parts per million levels set by regulators. Much of the debate surrounding Hu Honua’s environmental impact stems from the fact that the project was not legally required to conduct the most stringent state-level environmental impact assessment possible. Under state law an EIS is only mandatory when certain statutory are present. Those are things like the use of public funds, using land classified for conservation, or development within a certain distance of the shoreline. It appears that the Hu Honua project does not include any of those statutory triggers. However the Hawaii Cuntry Department of Planning told HPR that it requested Hu Honua complete a similar environemntal assesment and was satisfied that any impacts would be effectively addressed. On Wednesday the Hawaii Department of Health is holding a public hearing on Hu Honua’s permit application. The department’s Safe Drinking Water Branch will be evaluating the project’s impacts and hearing public concerns. But other potential hurdles exist. Several lawsuits have been filed seeking to force a more stringent environmental review. The case of a Hilo resident seeking to block the project was thrown out by a judge in September. A separate challenge was recently heard by the State Supreme Court. A decision has not yet been made in that case, which centered around greenhouse gas emissions. The State Department of Health (DOH) will hold a public information meeting and public hearing on Hawaii island for the Hu Honua Bioenergy, LLC facility located at 28-283 Sugar Mill Road, Pepeekeo, Island of Hawaii, TMK: (3) 2-8-008:104 and 161. Time: Informational Briefing from 10am-12pm. Public Testimony from 1pm-4pm. Persons desiring to speak are asked to submit two (2) copies of their statement before or at the hearing. Verbal testimony may be subject to a time limit if there are more than 50 testifiers. Written statements will be accepted until 5:30 pm on Wednesday, November 14, 2018, at cleanwaterbranch@doh.hawaii.gov or at P.O. Box 3378, Honolulu, Hawaii 96801-3378.